Quickly view Wikipedia without distraction or wait. Is there a better alternative to Pedia? Is Pedia really the best app in Miscellaneous category? Will Pedia work good on macOS 10.13.4? 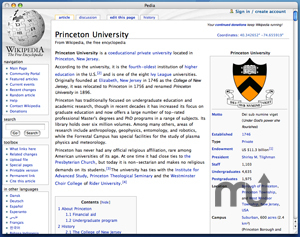 Pedia.app is a free application for Mac OS X from Tewks that allows you to quickly view Wikipedia and get the information you need without any other distraction or wait. Pedia is derived from and inspired by Chip Cuccio's great GCal.app and is licensed under the MIT license set forth by him. The browser is based on Apple WebKit. Pedia's logo was created by David Vignoni and is used under the LGPL license. Pedia needs a rating. Be the first to rate this app and get the discussion started!